Courtesy of WB Ericson, M.D. This patient is a healthy 60 year old white male who presented with isolated bilateral severe contractures of the small finger PIP joints (~110º) from Dupuytren’s disease. 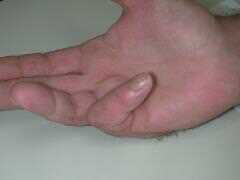 Surgery involved the McCash open palm technique and digital fasciectomy with Z-plasty in the small finger after which he still had a 45º flexion contracture of the PIP joint. 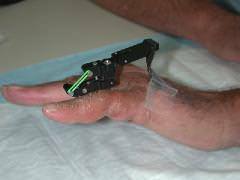 Kenalog was injected into the collateral ligaments at the time of surgery and the Digit Widget was the applied using the lightest weight elastic bands. 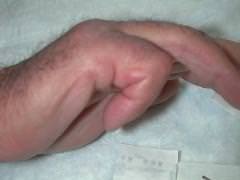 The patient had full extension within 10 days of surgery and the Digit Widget was maintained for a month. No hand therapy was necessary during this period of time. 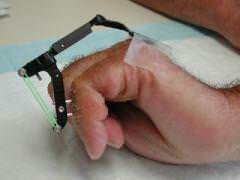 After the Digit Widget was removed, silicone gel tubing was applied along with an LMB dynamic splint. At 10 weeks post op, the skin was soft and he had a residual 15º contracture.